Aww... great friends! Great illo, Jo! 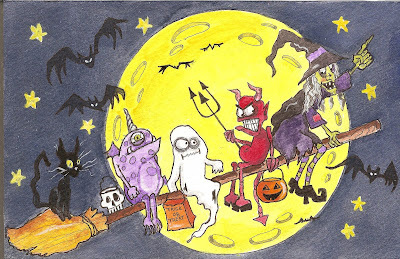 Great illustration, love the one eyed, one horned purple people eater too!!! heee heeee!!!! the lil skeleton bowl! wonderful, jo! too too silly! :) i love the drippy cat....too!! hee hee hee! Your broom is like public transportation for spooks.